Since the publication of the first edition of Urethral Reconstructive Surgery, important refinements have been added to the urologic surgical armamentarium. Extensively revised and updated, Advanced Male Urethral and Genital Reconstructive Surgery, Second Edition guides urologists in a practical manner on how to evaluate and manage complex urethral and male genital reconstructive challenges. Chapters have been added on wound healing, synchronous urethral strictures, non-transecting anastomotic urethroplasty (including muscle and vessel sparing), overlapping buccal grafts, male urethral slings, genital skin grafting, Peyronie's surgery, priapism, pediatric strictures and prosthetics. Such chapters greatly strengthen the overall appeal of the book. The volume closes with a new comprehensive appendix of preferred instruments. 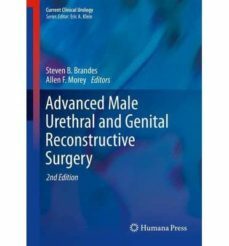 With broad contributions by international authorities in reconstructive urologic surgery, Advanced Male Urethral and Genital Reconstructive Surgery, Second Edition is a valuable resource for all urologists, from residents to reconstructive surgeons.